What are the most "rural/small" feeling BIG cities and what are the most "urban" feeling small/mid-sized cities? In other words, which cities with large city or metro population seem smaller or more rural than the listed population indicates...and what cities with smaller city/metro populations seem much more urban than their population would lead you to believe??? a) Cities that feel less urban than their population indicates..
-Phoenix. It definitely takes the cake for being a big city (5th largest city; 12th largest metro) that feels much more suburban than its population indicates. Its downtown has little foot traffic and the skyline is smaller than that of cities a fraction of its size. -Atlanta. The city's skyline is not too shabby, but for being the anchor of the south (8th largest metro), it is a surprisingly quiet sunbelt town in terms of foot traffic. b) Cities that feel more urban than their population would lead you to believe..
-Boston. This small and compact city (city pop: 609,000) is only the 10th largest metro in the nation, but its population density rivals that of Chicago's. Last edited by Lancer78; 09-11-2009 at 10:22 PM..
Honolulu feels and looks like a big urban city despite only having about 900K in the metro area. How many cities with less than 400K and a metro area less than 1 million have this much density? Hawaii is an island, the biggest one and has no major cities on it. 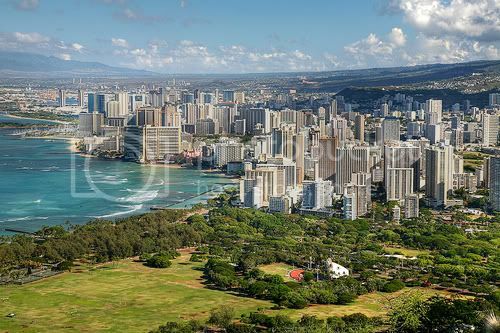 Honolulu is on the island of Oahu and there are some sprawling suburbs outside of Waikiki (pictured) and the downtown area (not in that pic) too such as Kanehoe on the windward side and areas on the east side of Oahu. I think it feels more rural on the other islands. The fact that it's sandwiched between a mountain range and the ocean on a small island in the middle of the ocean is the reason I think it's so dense. Last edited by sav858; 09-11-2009 at 10:24 PM..
Man, Honolulu looks nice in that pic up above! Hang on here . . . gotta take a minute to check and see when the next flight there leaves! Regarding the quoted post, interesting that you list Boston and Atlanta. There was a thread here a while back which posed the question which of those two cities felt larger. I wouldn't recommend slogging through that entire thread. Sprinkled through the thread is a little bit of discussion about what makes a city seem big, but for those nuggets of discussion about that broader subject you go through an awful lot of back and forth which basically says over and over either that Atlanta seems bigger because it sprawls on for about a thousand miles before you hit rural countryside or that Boston feels bigger because it is densely built and active in its urban center. One interesting point that thread made clear, though, is that there is a lot of individual difference when it comes to personal perception about whether a city feels large or small. Interesting that in the quoted post Lancer78 lists Boston as a city that seems larger than it is. I live near Boston and have often heard people say that Boston feels smaller than it really is. Nothing wrong with the fact that this runs counter to Lancer's suggestion because again there's that matter of differences in personal perception. I get the impression that people who feel that Boston is smaller than it is have that sense because of the fact that Boston is very much an old-style city that had much of its growth before the automobile age. All of Boston's major amenities are packed into a compact central area. A lot of people think of those few square miles as Boston in its entirety. They are largely unaware of the amount of territory covered by the outlying residential neighborhoods because the city's attractions are so heavily concentrated in that small central area that there is little reason for most people who don't live in those outlying sections ever to go there. File owntownPortlandMe3.jpg - Wikipedia, the free encyclopedia. Portland does not really seem like a big city. Some say it seems more like a large town. Still, the city's population is only about 65k. Maybe some of the pictures above will give an idea why Portland, while not seeming like a really big city, still always impresses me as looking and feeling substantially larger than it is. Most likely, one reason that Portland always comes to mind first when I think of cities that look and feel bigger than they are is that the first time I saw Portland, about fifteen years ago, when I saw how much more of a city Portland looked like than I had expected based on its population, this was the first time that I began to consider the effect of metro area population on the apparent size of a city. Because I associate Portland with that moment of epiphany, this little city always stands out in my mind when I think about this matter of why cities seem large or small. The Portland metro area population is approx. 500k, not huge but still large enough so that Portland serves a much larger population than the relatively small numbers within its official city limits would indicate. The presence of the number of buildings, stores, and facilities, and the infrastructure to support a population of several hundred thousand is most likely the reason that Portland seems bigger than the large town that its city-proper population would lead one to expect. Last edited by ogre; 09-12-2009 at 12:31 AM.. Downtown Hawaii? I guess it is downtown for the whole state. Anyway, West of Downtown there's a bit of suburban sprawl and north of Town in Kailua-Kaneohe there's a little more. Other than that, I love the small rural towns along the north shore. Lovely. Boy, we're really reaching for premises in this forum, aren't we? Yeah, but how many of those are hotels?